"Great! Kids love it! Adults as well. The best entertainer for in house parties." "Thanks Paul, Thanks Justin. Great show, great service." "Thanks for a great party! :-) This was the second time Mr. Bungles visited our home, and the party was just as successful as the first. Mr. Bungles was a huge hit." "Always a big hit with the kids!" "...He was fabulous. Our family and friends will be seeing this performer again and again. The chilrden loved him." "My son Colin was the happiest birthday boy ever! Mr. Bungles� humor was perfly aimed at young children and he gave my son the "star" treatment! He even involved my older son too. Pure birthday joy!" "You were very easy to work with and we enjoyed so much that all the kids were so entertained the whole time. Thank you!" "Really skeptical about hiring entertainment for the party due to past experiences. However, kids had a great time and the parents really enjoyed the show. Some parents even asked for contact info!" "The best part was interacting with the kids- making them laugh and keeping them happy while the parents could relax and enjoy the party." "This is the second time that we had Mr. Bungles at our children�s party, and hust as the first time, the kids and the parents loved it! Thank you for making an aseome party special." "Mr. Bungles had them laughing the entire time. He even went above and beyond for a little girl who cried because she wanted a flower balloon like the birthday boy�s sister- and he made her one." "You really added a ray of sunshine to a rainy day- thank you!!" 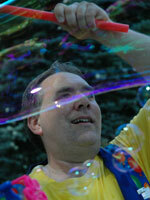 "Everyone loved the bubbles and being able to play with the different wands and bubble markers. This has been an annual event for three years now and will continue into the future!" "Great show as always! See you next year!" "Mr. Bungles was awesome at our street fair! He entertained a wide variety of children and even adults." "We love Mr. Bungles� energy!! Our campers absolutely love him and the activities-they�ve never laughed as hard-it was priceless! Thank you for 2 great shows!! See you next year." "We had a good time laughing and enjoying the performance. Ben was very happy because this was very special for him. Thank you, Mr. Bungles!" "Mr. Bungles was very entertaining and all the kids appeared to enjoy him! We would definitely recommend him to friends and family! Thank you!" "I liked the variety of acts which appealed to all ages (ranging from 6 months to 12 years). The bubble show was a great finale!" "The children loved the new addition of being inside the large bubbles, and tried this repeatedly!" "I loved every minute. Watching my two kids laugh with such excitement gave me such a warm and successful feeling. Mr. Bungles was amazing." "The kids had a good time thanks to Mr. Bungles." "Mr. Bungles had the kids mesmerized for a solid hour. Their laughter was deafening. I wouldn't hesitate to recommend him to a friend in search of entertainment." "The performer was wonderful and really interactive with the children. I would recommend them." "We really enjoyed your entertainment...Thanks again!" "...was a great addition to our event. He was able to capture smiles from a multi-generational audience. Very pleased with Mr. bungles and the magic show." "It was a great party thanks to Mr. Bungles. I�ve hard several peple ask for your info. Happy to recommend him - wonderful birthday." "You do an excellent job entertaining people, not only the young ones but everybody young at heart. Thank you so much." "Wonderful as always! Everyone had a great time- children and adults alike. This is going to become an annual event!" "Excellent!! The children belly laughed just as hard as the adults. It was a pleasure. Thank you!!" "He was wonderful! Fun, engaging & so entertaining the ENTIRE time! Thank you Mr. Bungles! My son�s birthday was great because of you! You made him feel so special!" "Both the adults and children loved Mr. Bungles. The games were entertaining and brought everyone together & the bubbles and balloons made it feel like a party!!" "We love how well you understand the sense of humor of preschoolers, how fully you throw yourself into your performance, and how kind you are to your audience and how nicely you mix in movement & music to include all the styles of your audience." "The kids really enjoy the bubbles. Mr. Bungles was a very nice man, even when the kids broke his stuff. Sorry." "The children really enjoyed both aspects of the party - bubbles & balloons." "He was incredible. All the kids were amazed by him. He does a fabulous job. My daughter still talks about him." "Mr. Bungles was very engaging and was able to hold the attention of not only the younger but older children as well. My 3 year old son was captivated by his performance, as were my 8 and10 year nephews." "I initially found your rates to be expensive, as compared to other balloon artists I have hired in the past, but the quality of the performance ended up surpassing my expectations." "Mr. Bungles did a great job, with such high energy of entertaining the crowd of 5 year olds, as well as keeping the interest of the older friends and siblings who were at the party. He was sill, funny, kept the kids giggling, got them up and moving just when they were getting antsy, and has command and control of the crowd for the entire time he was there." "Mr. Bungles is great and the kids loved him. I especially appreciated that he sensed our birthday boy (age 3) was feeling shy and he was very encouraging and gentle about getting him involved in the show." "Mr. Bungles was able to entertain about 20 6 year old boys for 1 hour, which is no small feat! Even the little ones were captivated by his silliness!" "Everyone was so impressed and enjoyed your performance. Thank you - Awesome." "Kids loved him. Great entertainment. Loved the balloon animals!" "I had so many parents tell me that their daughter enjoyed the party so much and couldn�t stop talking about it. Everyone had a great time!" "Mr. Bungles was great. He managed to keep a large group of 2-6 year olds entertained for a full hour. He made it a 5th birthday party to remember!" "Mr. Bungles was meant for the kids, but even the soldiers enjoyed him." "Mr. Bungles was a blast. The kids loved him and he made our daughter�s first birthday really special." "Mr. Bungles is so energetic and keeps the kids engaged non-stop! The looks of pure joy on their faces was priceless!" "My granddaughter's 6th birthday party will remain forever memorable because of the amazing show Mr. Bungles provided. I love looking at the party photos- the kids were all mesmerized and their enjoyment is so evident on all the laughing faces." "Will definitely look forward to having him entertain next time." "You were able to keep a crowd of 35+ kids aged 2-10 totally captivated the entire time! The adults loved you too! Many compliments from guests! Your name was passed on to many guests." "Mr. Bungles was wonderful. I am amazed as well as my friends that he kept 23 kids totally entertained for an hour in a tiny little room. It was wonderful...would use him again and definitely recommend." "Mr. Bungles connected with the children & kept them interested & entertained for the full hour. Lots of laughs and giggles...Many thanks! My son has requested you for next year!" "Mr. Bungles did a great job entertaining at my 1 year olds birthday. We had a wide variety of age ranges and all the children had a wonderful time." "What a great show...We will 100% be using him for future events! So glad we found him!" "Mr. Bungles made the children laugh the whole time. The fun and creative balloons Mr. Bungles made were a hit!" "Mr. Bungles is great- really works hard to keep kids entertained. He even entertained the adults." "Kids love Mr. Bungles. He really knows how to keep the kids entertained. The balloon characters are amazing." "Amazing talent! Who knew balloons could make such beautiful creations...Thanks for everything." "Kids loved it! Can�t believe you had an 18 month old sitting and watching. So entertaining!" "Loved the balloons! Bubble machine too...Mr. Bungles captivated his audience and kept them engaged. Thank you so much!" "Thank you so much for all you did...She loved her surprise and thought every part was great. You are so gifted at what you do!" "We were so pleased with Mr. Bungles and his performance. It was amazing how he kept 15 kids with ages ranging from 2 to 7 entertained for a full hour! He was very patient and kind to the kids. He had them cracking up. Couldn't have asked for a better entertainer. All other parents at the party agreed too!" "Absolutely Fabulous! Thank you so, so, so much!" "Thank you for making Jake's 1st so much fun!" "Great program! We will look forward to having you here at the Derby Neck Library again!" "The kids had a great time! The parents had wonderful comments as well- kids were engaged and laughing hysterically- you even had us sitting at your attention!" "Mr. Bungles was great- not only did he keep the kids laughing and entertained- I think the adults also enjoyed the show!" "My son had a terrific 4th birthday party! Mr. Bungles was a hit!" "Great show for this age!" "We look forward to seeing him again next year!!! Great balloon animals!!" "You managed our slightly antsy and ornery group so beautifully! The group of 32 3 and 4 year olds were rapt by your humor and you involved them expertly." 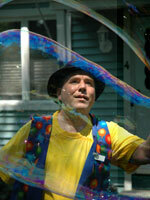 "The children really enjoyed the bubble portion of the performance." 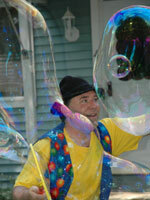 "The bubble show was great! Mr. Bungles was so nice to our kids and his bubbles were awesome. The kids really enjoyed it." "The kids had a blast, and parents were impressed. Paul is super patient and made sure everyone got a balloon. He�s very talented! Thanks again!" "Mr. Bungles had our room full of 3 year olds completely engaged and super-excited. His humor and games were well received by all, and his creativity with balloon animals impressed both adults and kids." "You could tell he loves to make kids laugh." "Kids couldn�t stop talking about Mr. Bungles. Days later they are still smiling and clapping when balloons pop." "Thanks! The bubbles were a big hit." "Balloons were fantastic! He made sure everyone got one in a short period of time." "Great Experience! Kept the kids engaged the entire time." "All the kids loved the show! I would definitely recommend to friends and family. Thanks so much!" "The kids really enjoyed him and all his activities. I liked how he interacted with the adults also. The balloon creations were awesome! Thanks again!" "We saw Mr. Bungles at another party. I had never seen my older son laugh so hard! We knew we needed to hire him for one of our parties!" "Great job! Very funny, my boys loved it!" "Mr. bungles was wonderful for my 4 year old and 1 year old birthday party! The children and their friends laughed form the moment the show started until it ended. This was the second time we had Mr. Bungles entertain our young guests and he never fails to make the kids have a great time." "I was thrilled with the reaction the kids had, they were very enthusiastic and participated the whole time!" "Thank you for a fantastic show!" "Was willing to wait for late guests. It was for my twin boy�s one year old party and he made it fun for all young and old." "Great time was had by all, thanks!" "I was skeptical as to whether Mr. Bungles could keep a group of 2 �-3 year olds attentive for one hour. I need not have worried, from the moment he began he had a captive audience who laughed and participated all the way through. Great fun and worth the loot." "Engaging two year olds is no easy feat, and Mr. Bungles did it! His balloon animals were great! He was also good at including all the kids." "Great job! Kids really enjoyed themselves and I still hear what a great party it was." "Great job once again. The kids really enjoyed the show Mr. Bungles performed. The balloons again were a big hit." "Mr. Bungles kept all our young guests interested and entertained. My nephew is now intent on having you at his upcoming party- no better testimonial." "It was wonderful to see all the kids laughing so much. Megan was so excited at times- thank you for helping to make her day special." "Great work and mighty impressive commanding and entertaining the attention of 34 seven year olds! Wow- many parents were also impressed!" "Wonderful, very nice, and enjoyable. Thank you." "Thank you so much, we loved it!" "Mr. Bungles really knows how to keep the children engaged and entertained." "All the four year olds and five year olds LOVED Jasen. He easily kept their attention with all his magic tricks. The parents loved his acts and tricks too." "The kids were enjoying every moment. I and all my friends at the Trump Tower building in White Plains will be hearing from you." "The kids and the parents LOVED Mr. Bungles. He kept the 20 kids and parents involved the whole time. We just loved the party thanks to Mr. Bungles." "The kids and parents were extremely entertained and enjoyed every minute! Thank you for a fantastic party! The kids are still talking about the party a week later!" "Was a great time for kids! They loved it." "Very professional. My son found Mr. Pongo really funny and his jokes were really appropriate to the different ages." "Outstanding job, the wedding guests were certainly surprised and all loved it. We are so glad to have invited him to our party." "Mr. Bungles engaged the children at the party and they all had a great time. We would certainly recommend Mr. Bungles." "Mr. Bungles and Tony really outdid themselves. There was not a time when they did not have smiles on their faces. They entertained the crowd from start to finish! They were totally awesome." "The children had a wonderful time!" "My son still talks about Mr. Bungles visit to our house and how much he loved him. He asks for Mr. Bungles to come visit us again almost every day!" "It was Ryan�s 5th birthday. We had 20 5 year olds. I was so nervous. But Mr. Bungles did it again. He made every child feel special. He handled the crowd with great talent! Who do you know that can bring a smile to 20 5 year olds? Thanks Mr. Bungles!" "The squeals and giggles were over the top-what joyful noise. Thank you." "Mr. Bungles made my daughter�s birthday extra special! Kids of various ages were engaged, smiling, and enjoying themselves!" "Mr. Bungles was a great hit for Anand�s party. Kids had a great time and lots of fun. Everyone was very happy with the balloons. I will call Mr. Bungles for our next events also." "The Bubble Party was a great addition to our 1 year old�s pool party! The kids as well as the adults enjoyed playing with the bubbles." "Campers had a wonderful time as always." "My son and his friends had a wonderful time at the party. It was amazing how you held 18 4-year old�s attention the entire performance. Many of my friends commented on what a great party it was and would use your services in the future." "Mr. Bungles created some wonderful balloons for an Under-the-Sea theme birthday. He did not disappoint and our guests were asking where we got the balloons from. Great job and great creativity. Thanks." "Always very entertaining and engaging regardless of the age. Everyone had a great time." "Great entertainment - all age groups, 2 - 8 enjoyed." "The humor captivates the youngsters. It�s good, wholesome fun for young kids. The children were totally engrossed and thoroughly entertained." "I unfortunately did not get to witness most of the show but the laughter and excitement I heard from the other room assured me the kids were having a great time." "The balloon animals were great. Even my 2-year old stayed and watched for almost the whole hour. She usually doesn�t stay still for a minute." "My son asked me for 2 clowns for his birthday party, and we got more than 2 clowns. Mr. Bungles exceeded our expectations. His friends are still telling us that the party was AWESOME!! Thank you...you are great!!!!" "My 3-year old, Grace, cannot stop talking about Mr. Bungles. Not only was she totally amused by his antics, but she was made to feel very special, being asked to assist him with various tricks and games throughout her birthday party. It was a day she�ll probably never forget." "Awesome! The balloons are fantastic!" "The kids LOVED Mr. Bungles! This is the second year in a row that Mr. Bungles entertained at my children�s birthday party. He was a big hit!" "Everyone enjoyed you so much - the children and the adults too. Mia is still talking about you and so are her little friends at school. IT was an awesome day for Mia." "This was the second time we invited Mr. Bungles and he was amazing. The next day Andy was just thinking about Mr. Bungles and he was cracking up! Thanks Mr. Bungles. All my guests are still talking about it :-)." "At any time ~ should you need a referral, recommendation, or if I may even help you ~ let me know!" "The children really enjoyed the balloon hats and were more interested in Mr. Bungles than bowling! Thank you for making a good birthday party great." "His show entertained all ages; very animated & high energy performance. His balloon creations were out of this world! When I asked my 5 year old what her favorite part of the birthday was, she said, "Mr. Bungles!" "All the kids had a great time, even my one year old, who never sits still." "Mr. Bungles made the party! All the kids are still talking about the fantastic balloons and the fun show!" "Thank you so much for keeping the kids happy, busy, and laughing at Alexa�s Bat Mitzvah at Splash...I don�t think my younger son or daughter will EVER forget the cereal relay race. Too funny." "You were awesome! Thank you, thank you!" "The 5-year olds at my son�s party are still laughing about Mr. Bungles� performance. Thank you for providing such fun, age-appropriate entertainment." "I was very impressed with Mr. Bungles and how he kept 11 four year old boys for the whole hour! It was a wonderful event." "We would highly recommend, as the kids were very excited and enjoyed the show..."
"Already recommended Mr. Bungles. He handled the kids very well!" "Great! All the kids had a wonderful time. We have great pictures of them laughing!" "Great job! Children and adults were both entertained!" "Everyone loved him. We even had some adults who loved the whole thing. Thanks!" "Mr. Bungles was amazing! He kept the kids entertained from the moment he arrived until he walked out the door. My daughter keeps asking when he�ll be coming back, which is the highest compliment he could get." "Excellent! All the kids were hysterical! The parents were impressed how you held the children�s attention for 1 hour. Thank you!" "Mr. Bungles did a great job at keeping all the children entertained. All my guests said that their children had an amazing time. Thanks a lot, Oana." "Mr. Bungles was a huge success and managed to keep a wide range of ages entertained." "Everyone enjoyed Mr. Bungles performance. The kids (and adults) were laughing the whole time! I particularly like the special attention Mr. Bungles gave to my daughter, the birthday girl! Thanks!" "I enjoyed your performance and I�m looking forward to doing business with you in the future." 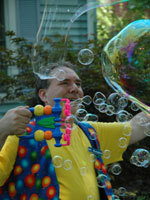 "Mr. Bungles was friendly, fast and entertaining while making balloon animals & shapes. Very professional, I would use again." "Mr. Bungles never stopped twisting balloons for four hours. Everyone loved him and he was never without a smile. It was 95 degrees that day!" "Everyone had a wonderful time and you made Christopher so happy and laugh so much which was priceless to us!" "Did a great job! Worked very hard to make the kids happy!!" "We hired Mr. Bungles based on a recommendation from a friend who attended a party where he performed. Mr. Bungles kept the attention of all the kids even the ones who were younger than 3!" "My 30 year old sister had as much fun as my 3 year old daughter. Thank you so much!" "He was great!!! He had the kids and adults laughing!! I�m already thinking about next years birthday party." "I just wanted to thank you for making Christopher�s birthday so much fun. He loved that you came to his party and didn�t stop laughing the whole time! He always tries to imitate your act, which is too funny. Everyone thought you were wonderful and I�m sure you�ll get some referrals from the parents that were here. Thanks again and I�m sure we�ll see you soon!" "The children found Mr. Bungles very entertaining. The physical humor was perfect for them. They especially loved when he threw his hat and couldn�t catch it!" "Did a good job appealing to a fairly wide age range of children." "Kept the kids laughing and interested- they all had fun!" "All the children were totally engaged for the entire performance, and thoroughly enjoyed every moment." "You really kept the kids laughing and engaged the whole time. Thank you." "The kids all loved seeing Mr. Bungles but honestly I think I enjoyed him more." "The children really enjoyed the parachute games, and you kept a large group of kids happy." "My daughter loved Mr. Bungles so much, she pretended to be him for days after her party doing tricks and being silly." "We had a big group with a big age range - he (Mr. Bungles) held the attention of the whole group for a very long time!" "I was very pleased with your performance and the activities you brought to the occasion. I believe many of the mom�s thought you were great too! Of course the kids loved you! Thanks!" "Mr. Bungles had the children and adults laughing." "The children were captivated by it all, as were the adults. Not a single yawn. Mr. Bungles was A++. I would definitely use him again." "My son enjoyed you very much - especially the giant balloon hat you made for him! Thank you!" "Mr. Bungles was absolutely great. I loved his techniques for captivating kids. They were very, very excited. Thank you so much for making the party a success." "Great entertainment for a range of ages." "I have (recommended Mr. Bungles), and will continue. Great Job." "The three and four-year-olds were literally rolling on the ground with laughter!" "A job well done. The kids loved it!" "Great job keeping their attention. Lots of laughing." "The kids loved Mr. Bungles! He had them laughing the entire time. He is very good at entertaining kids. Bubbles were a blast as well." "Our guests, particularly the kids, had so much fun. Everybody left with a BIG smile on their faces - what with the beautiful balloon creations - just great. Thank you." "Heard many kids in audience comment, �He�s really, really funny.� Kids of all ages were fully engaged and laughing throughout. We could not be more pleased. Thank you for making our daughter�s party such a success." "A true professional and very creative, talented and able to handle "kids" of all ages. A gem to recommend!" "...Thank you for helping to make my Mom�s 90th birthday celebration a special event." "You were great. I think half the adults there want to be clowns now! The kids absolutely loved it." "The party was great! The adults enjoyed the show as much as the kids. I am still getting calls from people saying how much they enjoyed Mr. Bungles." "Excellent job! Kids had a blast and you had their attention for almost one hour - I never heard so many belly laughs." "We had a very large and diverse group of children who were all happy and fully entertained. Thank you Mr. Bungles." "Liam and family enjoyed Mr. Bungles very much. Mr. Bungles captured the children and the adults as well. Professional, funny and appropriate." "Extremely professional, courteous and patient. Creative, talented and awesome!! Highly recommended." "The balloons were a hit! You even managed to make the unexpected. Thank you." "Thank you for making Timmy�s party fun for everyone who was there!" "Thanks for making my husband�s surprise 40th birthday party a hit! Your balloon creations were beautiful!" "Mr. Bungles was terrific and engaging." "Mr. Bungles did a superb job entertaining fifteen 3-5 year olds in my home. There were giggles galore and not just from the "kids". Would highly recommend. He knew just how to hold the kids attention, enabling a successful, focused "home" party." "The kids loved the show. I heard parents making positive comments. Great job!" "The kids absolutely loved it! They were hysterical for the entire hour." "Mr. Bungles was terrific. Children of all ages, and the adults, really enjoyed themselves. I was amazed that Mr. Bungles was able to hold their attention the entire time. Thank you for everything!" "We love Mr. Bungles - thank you for a great party." "Yes, I would recommend you, and I would use you again! All the kids and adults are still talking about how great you were. Thank you!" "Mr. Bungles was great. He entertained the kids for the entire time he was here. All the children & their parents talked about how great Mr. Bungles was for days. We would have Mr. Bungles back again - he was the hit of the party." "According to other parents, their kids talked about Mr. Bungles for many days following the party." "Alexandra and her friends had a wonderful time. Mr. Bungles had them captivated from the moment his show started." "Mr Bungles kept over 50 young children entertained for a full hour-that is not an easy feat." "This is the second time we have booked Paul for our church fair. Again, his warm, friendly and inclusive manner was a big hit with children and their parents." "Kids loved Mr. Bungles and having balloons made ahead was excellent idea - balloons themselves were excellent and enjoyed as much by adults as children." "The adults were just as attentive and excited as the kids." "The kids were hysterical and captivated the entire performance." "The kids had so much fun thru the whole party." "Both children and teachers thoroughly enjoyed the activities and had a great time!" "The most important part was keeping 18 little kids entertained & you did it! Lots of laughter & squeals - always a good sign!" "Please extend Mr. Bungles a very big thank you for delighting the staff and customers on Friday, July 13! Children big and small, all had big smiles! It was definitely something I would recommend to my peers and plan again for my clients!" "Paul...thanks again for a great show...the kids loved it and have been talking about it ever since. Lindsay May is still trying to figure out the magic! Let me know if you ever need a reference!" "I really enjoyed Mr. Bungles, the kids and parents also enjoyed his performance. After the party the parents said he was great and he interacted well with the kids." "Kids really enjoyed the show, as usual. Balloon animals are always the hit of the carnival." "The kids loved you! Thank you so much." "Thanks you so very much for the beautiful show you did at the 60th wedding anniversary party for my friends the Morrows. You were GREAT!!" "Mr. Bungles was the life of my son�s First Birthday party. He had all the kids and even the adults laughing. He was the talk of the party, during and after. I will definitely use him again." "Just..."THANKS" & the balloon animals were amazing!" "The kids were excited & engaged by Mr. Bungles & had a great time! Our musician, who came on immediately after Mr. Bungles, said that he was one of the best clowns he had ever seen." "Great job Mr. Bungles! We�ve had Mr. Bungles 2 yrs in a row for our kids and they had a blast both times!" "He provided great entertainment for our son�s party - kids of various ages enjoyed his performance." "Thank you so much for a job wonderfully done! Andy still talks about the great Mr. Bungles. Thank you again!" "Great Job! The kids really enjoyed the balloons!" "All the kids enjoyed the entertainment and the balloons. They had lots of laughs and certainly had a good time." "Mr. Bungles was a great hit at my son's second birthday party - All of the children really enjoyed it and there were many laughs." "I thought Mr. Bungles did a fantastic job in keeping a young crowd entertained. That is not an easy task!" "Paul you were great! Thank you for joining us despite the short notice. Your balloon creations were fantabulous!" "...everyone enjoyed the performance, children & adults. Anyone that can capture my son�s attention for one full hour has a spot reserved at our next party. Thank you." "My 8 year-old daughter chose to have a spy party. Mr. Bungles did a great job preparing for and executing the spy theme. The balloons were great & the kids really had a great time! Lots & lots of laughs!" "Everyone was wonderful. I could not have asked for better entertainment. The kids enjoyed the entertainment so much, I feel you and your staff are the best around. Thanks for a great time!" "You were perfect for our party - The kids had a great time - they were all entertained and well behaved. Having the balloons done in advance was great!" "Your enthusiasm and silliness translated beautifully to the 4 year olds at the party. It was perfect!" "You were great!...All in all, everyone had lots of fun. Thanks." "Thanks! He was great. Definitely would use Mr. Bungles at our next event." "...I wanted to thank you for a GREAT party. Noah talks about Mr. Bungles all of the time. We all had a great time...You really know how to connect with the kids and put on a fun memorable performance - All the best." "Fantastic! My daughter Adeline loved having you - she still talks about when Mr. Bungles can come back! Thank you for making her 4th birthday so special." "You were the highlight of my son�s 1st birthday party. Everyone really liked your show. You did exactly what you said you would do..."
"You know you had a great party when children don�t want to go home! Mr. Bungles was great & the original balloons he brought were well worth the extra $$." "Mr. Bungles was very accommodating and flexible. Both children and adults really enjoyed his participation at our event." "Kids love the balloons - It�s so great to have all walk away with a fun memento." "Mr Bungles was great! He kept all the kids of different ages involved and excited. I couldn't ask for anything more!" "Lots of kids and everyone was entertained for a long time. Great Fun!" "We really enjoyed how you involved children in movement activities, word play, humor and music! It was very engaging and completely appropriate for 3-5 year olds." "The children truly were captivated and excited by Mr. Bungles." "The children and the adults were all delighted. Several parents expressed surprise that the children were spellbound for 90 minutes." "Our staff really enjoyed your creative balloon animals and objects. Thanks for making our Employee Appreciation Carnival day special." "The kids and the adults at my son�s birthday party enjoyed Mr. Bungles� performance tremendously. The kids could not stop laughing and they were completely engaged for a full hour!" "Paul, I want to take a minute to thank you so much for giving my girls a day they will remember for a very long time and for a day I will never forget. You made my girls 4th birthday the best I could have imagined it to be. Thank you again." "Dear Paul, I just had to let you know that the feedback from the party was great! Bill did such a wonderful job with the caricatures, he was busy all night, I don't think he ever took a break! I know one of my uncle's brought him something to drink, but I don't think he ever moved from his chair. The balloons you did were unbelievable! Everyone from age 3 to 70+ LOVED them. I must say that I didn't really pay that much attention to your magic/juggling act. I was too busy watching the children laughing. I have never seen my nieces and nephew laugh that hard and for that long. The magic you perform is not just what you do on stage, it's also the reaction of the children. Some of the 'children' were over the age of 30. Thanks again for doing such a wonderful job. It will be a party that we will all remember." "Mr. Bungles kept the children (multiple ages) entertained. He was funny and a wonderful performer. My one-year-old loved it!" "We were very nervous about the weather and how it would effect our son�s �circus.� You were great! You were adaptable, calming to nervous parents, and the kids had a blast! Thank you!" "The kids really had a great time, a lot of laughs and excitement. The kids were completely entertained." "Great job. The act was aimed at the right age. The children are still talking about it 3 weeks later." "Got the party off to a great start. Both children (ages 2-6) and adults (to age 90) loved him." "Awesome. Received really great feedback from our guests. The children loved the animal balloons." "I really loved how you got everyone involved young and old! It was great!!" The children were ecstatic the entire time. I am still hearing about how fun her party was one month later! Thank you so much." "Everyone really enjoyed having you at Emma�s second birthday party! The music and tricks were perfect. We look forward to seeing you again in the future." 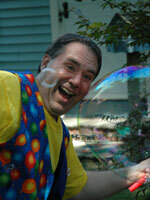 "I�ve used Pongo The Clown Party Talent 3 times and each time he gets better and better. The kids really enjoyed Santa (2 years in a row) and Mr. Bungles. Keep up the great work." "My daughter had so much fun! Thank you so much." "It is worth every cent to have a party with great talent to enjoy. Your production set our parties above the rest. Thank you, see you again." "Looking back at pictures of the children faces and seeing the smiles I�m grateful for the wonderful job you did." "Everyone enjoyed the day! The balloons were wonderful and we can�t wait to have him back!" "Everybody had a wonderful time from babies to adults. Our son Ryan still talks about it today. We would not hesitate to book you again. Thanks." "This was the second time we used you and would do it again in the future we had Pongo this time and Mr. Bungles last time and both times you were unbelievable, he is the best entertainment for kids of all ages! I had the ages of 1 year to 100 and he had everyone attention at all times. Pongo The Clown Party Talent gets 100 gold stars in my book." "Thank you so much for your awesome show and participation at the �Carnival of Life� event. The kids and adults loved you. Thanks for the laughter and smiles you brought to us all. Hope to see you next year!! Thanks from all of us with the TMF." "We loved having you come to our party! All the kids (and parents) laughed and laughed. Your energy and silliness were completely contagious! Thank you for sharing your marvelous talents with all of us." "Thank you for the beautiful performance. Although we did not have a lot of children, as expected, all the adults enjoyed the entertainment." "Mr. Bungles captured the children�s attention from the moment he walked in the door. Not only did the kids have a great time during the show but so did the adults. You made my daughter�s first birthday party a very memorable one. Bravo!" "I�ve really enjoyed Pongo�s Mr. Bungles. He made my daughter�s 4th birthdapy a blast. Thanks so much. I look forward to see you soon." "Paul is a real pro! Children and adults enjoyed the show tremendously." "Laura said it was the best birthday ever and her friends enjoyed your performance also, as well as thoroughly entertaining the adults!" "Everyone all different ages had a wonderful time. It was great to see 13 children with great smiles on their faces." "Attentive, prompt arrangements with lots of options. Excellent follow-up. Thank you!" "Thank you for making my son�s 1st birthday memorable. Even the adult guests enjoyed." "I had so many compliments from parents on how they and their kids enjoyed the entertainment and party. I have told friends of ours and at the church about your company. I even gave them business cards." "Great job. All of the children, and some of the adults, were fully engaged." "Very engaging and held the kid�s attention. Used the proper level of humor for the age group. Had diversified activities." "Mr. Bungles was appropriate for the age group. The kids enjoyed it." "You did a great job. Thanks for managing the 'large' crowd." "Mr. Bungles did a great job - kids loved him. And I really appreciated how he took charge at the party. While all of us organizing were busy in the kitchen, he just gathered up kids and started. Thank you!" "I thought you were a great entertainer...You kept them going all the time which was great." "Mr. Bungles was able to capture and hold the children's attention for over an hour, not an easy feat with a group of toddlers. They loved the performance, as did their parents." "A great time was had by all. Thank you!" "Great job, Paul, for the Diwali Party hosted by us. Look forward to having you again with us soon." "Great fun! Paul is wonderful at improvising." "You were absolutely hysterical and thoroughly enjoyed by the children and the adults!! Everyone in the room was cracking up. My mother's eyes were watering, she was laughing so hard." "I just wanted to let you know what a "blast" all of the kids and the adults had at Christian's birthday party. It was amazing how you kept everyone involved and entertained. We all loved you!!! I will keep you in mind for our next party. I think the parents enjoyed it almost, if not more, than the kids. You're great. I couldn't have imagined better entertainment for my son's first birthday. You'll be recommended highly." "Thank you so much for a really great time! Especially, trying to find my son David (4) who was reluctant to come to the front yard. He is still talking about 'the funny man' (Mr. Bungles). Today was his real b-day & he asked if the funny man was coming!" "For the second year in a row, Paul managed to keep our crazy kids entertained for a full hour. Thanks Paul for a great party, made perfect by you." "Thanks for making my son's birthday special. He and his friends really enjoyed the show!" "Had a very nice way with children and understood what makes them laugh. Our daughter was delighted at the silly games & music and had a wonderful time. She still talks about Mr. Bungles!" "My son Bobby said you had a great show, you were very funny & he liked the show a lot. The rest of our guests concur!" "My six year old thoroughly enjoyed your humor and silliness, as well as the rest of the guests." "Friendly and kept all the children happy. Great at making balloon animals." "Great job - everyone loved your talent and the kids had a fantastic time...all smiles and full attention - amazing!" "You are great. You made Rachelle's birthday really special, funny and enjoyable. Now 3 weeks later Rachelle is still trying to juggle her toys. Thank you..."
"Thank you for the great performance and making our party a huge success with the kids." "Even the adults loved the show. It was the best performance they had ever seen at a party. Thanks for making everyone laugh! We will highly recommend you to all our friends & family." "Just wanted to thank you for coming to the picnic yesterday and lifting everyone's spirits and getting the party started. Mr. Bungles was just what we needed to get things off to a fun start. Everyone was so pleased and I look forward to having you at future RTC events. I will certainly be in touch for the next RTC picnic in August 2005. Also everyone was so impressed with the balloon creations that you made, I have to say I have never seen such elaborate balloons. Thank you." "Very entertaining! Mr. Bungles interacted with the children so well. There was near constant laughter. He gets onto the children's level and is just so silly!" "Thank you once again for a terrific experience for our campers. They enjoyed the show and we are looking forward to seeing you next summer." "I was very pleased with how you kept all the guests involved and entertained." "The children and adults really enjoyed your show and the balloons are still being talked about ~ Thanks again!" "I think he is great. He cleans his room, brushes his teeth regularly, eats his vegetables and calls me once a week or so. But what's with his shoes?" "Thank you very much for the beautiful performance. We enjoyed it very much." "Your interaction with the children far surpassed any expectations (considering the wide range of ages) Even the parents had a blast!" "We were so pleased with your performance. All the kids had an absolute blast! I think this sums it up: one of my friend's daughter (7 year old) is still mimicking bits from your performance. Thank you so much!" "It was amazing how you played to all the different age groups- great to see you again..."
"Thanks Paul - Saturday was a great day." "Thank you very much! It takes a special individual to keep the attention of 25 toddlers. You were certainly the highlight of the day." "Awesome job! Great rapport with the children - You are a natural." "...The children loved you. Amazing balloon creations! Thank you." "Just wanted you to know what great things were said about you. Everyone really enjoyed your talents. Thanks again for coming from so far. See you next year." "Wow, Mr Bungles was great!!! Everyone enjoyed your performance at Christian's birthday party on Saturday so much, Paul. We were all talking about how much fun we all had-you were wonderful! You really tailored your show to appeal to all the ages at the party - and the adults loved it, too!! We all got such a kick out of watching how much fun the kids were all having and listening to them giggle and laugh. You held their attention for the whole time - not an easy feat! They loved the juggling, your jokes, the music, the balloons and everything! Mr Bungles was a big hit. Thank you again, so much, Paul. We hope to see you again at another party." "...Your balloon hats were great and from what I could see, your interaction with the kids was great." "You were great, enjoyable to all. We would definitely use you at our next event." "Really enjoyed the entertainment. Thanks!" "Mr Bungles was absolutely wonderful. He was able to keep all 20 children entertained, busy and happy regardless of their diverse ages. Good job!" "You did a great job entertaining everyone! Adults, kids and even teenagers. I know it was tough to plan for, given the age ranges, but we really appreciated how well you adopted for all." "Mr. Bungles (Paul) was very professional, both before and during the event. A pleasure to work with. Thank you!" "You were so funny and the kids loved you so much. The parents were happy for their kids and most of them got your number. Thank you for making Omar's birthday so unique." "I have posted some of your cards at a shop in Wilton. Everything was great!!! You were wonderful with the kids." "Very professional and kind enough to bring extra balloons for the late showers." "Total professionalism...you take great pride in your work." "Olivia loved your performance you held the kids attention the entire time. We thoroughly enjoyed the show!" "Mr. Bungles was a great entertainer for the 2-3 year olds and made the afternoon very enjoyable and interactive!" "...The kids were very excited and you kept them entertained. I appreciated the manner in which you handled such a large group of kids. They clearly had fun and found you very entertaining." "You were a great hit for the children...thanks a million!!" "We've had more compliments on how well the kids were entertained during the party. The adults were pleased as punch that their kids had just as good a time as they did. Thank you!" "He really knows how to entertain the kids because he is absolutely funny. He did make the party!" "Great job- thank you! Several of my guests commented on how much they enjoyed your show. All the kids loved you." "You were awesome. Good luck!" "Thank you so much for your performance at Adrianna's 5th birthday party this past Saturday at the firehouse. You were fantastic and everyone absolutely loved it. I would highly recommend you and will call you for future parties. Thanks again"
"Very happy with your performance. The kids really had a great time"
"You did an exceptional job. Thanks!" "Thank you for a great performance. Everyone loved your show, children and adults..."
"Exceeded expectations, was exceptional w/ the children." "Jennifer says you are very funny. The teachers at Jennifer's school thought very highly of your performance as well." "I think it is great that you make the children and adults laugh with the same jokes. Everybody thought you were great and the kids had a blast. Thank you "
"I was very excited to see the children especially Paloma, my one year old, enjoying themselves and having so much fun. It was a hit." "Thank you for doing such a great job at our daughter's first birthday. The kids really enjoyed the juggling and the balloons were the best!!! Everyone said they had such a great time! Thank you !! "Some of the 3 year olds were scared of the costume but I thought you handled it well. Thanks for making the party fun!" "My family enjoyed your visit. I watched the video over thanksgiving and it made me smile to know that your show brought out so much laughter and joy out of the kids and adults. Thank you!" "Wonderful! Magical! All we wanted was accomplished!" "Great show! Kids and adults loved it." "...Yes we all enjoyed your show and thank you again." "Paul I really enjoyed you as well as the group of kids and I would most definitely recommend you and consider you for a future event." "Everyone had a great time. The party is an event they all enjoyed." "My six year old daughter loved the "snakes" that popped from the cans as well as getting tatoos--Also singing the Happy Birthday song the wrong way was hysterical. My 4 year old son loved the balloon animals. He also thought it was very funny when you first arrived and couldn't find the birthday boy...but of course you eventually found him and he knew from that moment on that this was going to be a special party just for him -- Thank you!" "Thank you for making Christopher's 4th birthday party such a memorable event! You had a great impact on all of the children (& adults) and I was amazed at your ability to keep their attention & to keep them entertained for the entire party! Kudos to you!" "He was great. The kids had so much fun he kept the kids totally entertained. His performance was wonderful- full of excitement and full of laughter." "I was very surprised at how long you actually held the childrens attention. They really seemed to enjoy the whole show." "Thank you for a fantastic party for my children. What a great job despite blistering heat - I can't believe you were able to keep such enthusiasm. Some of the children were truly mesmerized by your performance. My daughter was completely engaged and my son, who was frightened at first, really relaxed and seemed to enjoy the show. Thank you again." "...the kids really laughed a lot & had fun!" "I think for the younger age the songs were great...."
You were Awesome!! The children loved it!! I�ve already given your card to my friends. I�ll see you in the fall for my other son�s 4th birthday." "The kids loved the snakes in the can the best. They had a really great time and are still talking about the party. The best thing for me was watching these kids cracking up. I loved it!! Thank you for a great party!" "I enjoyed how you involved the adults. I think that the kids as well as the adults enjoyed the game w/ the parents." "The kids had a great time at the party. Even the adults laughed a great deal. Gracen is surely too young to remember your performance but you made a lasting impression for the rest of us." "Jaime truly enjoyed your performance. Thanks so much. You helped to make her day!" "My son and his friends really enjoyed your performance. They laughed so much." "All the children really liked you and some of them still talk about you and the things you did. You were wonderful." "Anna said she would love you back for her next party. Everyone said what a good time they had at Anna�s party"
"My daughter commented on how she�d like you for her birthday. Many parents also commented on how well you engaged the children. Job well done!" "Pongo the Clown - An amazing comic that will make everyone laugh." "...He is known as one of the finest, funniest, and most reliable clowns available"
"Get Ready to laugh! Pongo The Clown has an amazing approach with kids�He has amazing comic timing and improvises with all the kids and adults, giving everyone a chance for a good belly laugh�He comes ready with a cart full of crazy props�funny, reliable and reasonable"
"Pongo the Clown is known throughout Connecticut as one of the funniest and most entertaining clowns around�He fills a birthday party with tons of giggles and laughs and is often asked to perform at company picnics and catered events"
"Get ready for the party everyone will remember. Pongo brings years of experience and skill to birthday parties, corporate events and festivals, entertaining children and adults of all ages. 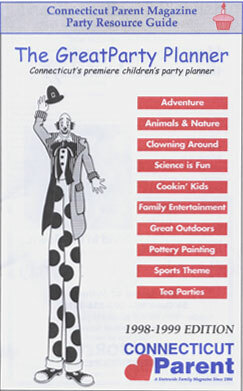 Pongo is a member of Clowns of America International and Stamford Hospital�s Health and Humor Associates. Reasonable rates, reliable and simply the best investment to make sure your party is a success." Click on buttons to read past letters.